The holidays are near, and any gadget from Apple is a perfect gift for anyone, regardless the age, the gender, and even the socio-economic status (as long as he or she doesn’t work for Samsung though, just joking). If you totally agree, then you could start searching for the perfect Apple gift right now. 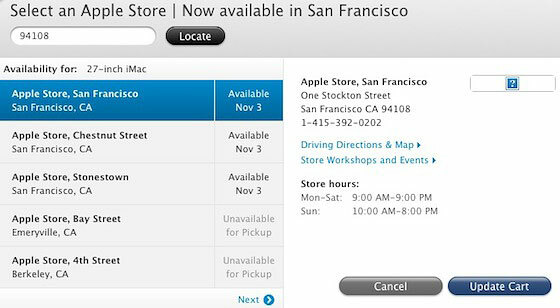 You don’t even have to drive down to the nearest Apple center, you just have to access Apple’s online store. The Apple online store has a few shortcomings though, but if you check it out right now, you’ll soon discover that these shortcomings are gone already. Apple fixed it up just in time for holiday shopping! What are the shortcomings that we’re talking about? Allow us to enumerate each for you. Remember though that this may not apply to everyone but technically they’re already solved anyway. First of all, their online store, since it caters to the Apple needs of the world always run out of products. If you haven’t experienced being ran out of the gadget that you were aiming for, then you’re in luck because this happens to a lot of people. This new feature fixes that. the next bothering feature of the online store is the shipping cost. Of course, there are cases that Apple’s shipping is free, but this doesn’t happen all the time. The new feature fixes this as well. Another problem is that even if they do not run out of their gadget offerings, they tend to ship late or deliver your product on an unbelievably long period of time (especially if you’re dying to get your hands on your latest gadget). Again, that’s solved! Finally, even if almost everything could be done online now, there are still a lot of people who are extra cautious on buying things online, in fear of getting hacked, losing money, and evil people getting their hands on their precious private information; especially when we’re talking about gadgets here because Apple’s gadgets are not exactly cheap. This is solved as well. You might be thinking already, what is this new feature anyway? And how did it solve a number of issues that are totally unrelated to each other? It’s the feature to let the consumers pay and pick up the products that they have ordered online at the nearest Apple center. With this, you’ll never be left out of the latest gadgets because they’re not going to run out before you buy them anymore. These centers have enough supply for the place that they’re supplying for. You’re not going to handle ridiculous shipping cost anymore because there’s no shipping! You control when you’re going to get your product. Say goodbye to stressful waiting. Finally, there are no machines that are going to handle your financial information because you can pay for your gadget the moment you pick it up. We sure hope to see even more improvements on Apple’s Online Store. then Christmas shopping is going to be way easier, and gift-givers as well as gift-receivers are going to be way happier.